The Boggabri Drovers’ Campfire has become a much anticipated feature for caravanners, motor home owners and travellers along Australia’s highways and byways. The event was the brainchild of Lion Geoff Eather and was developed with the support of the Boggabri Lions Club. The Boggabri Lions Club, as in previous years, have prepared a wonderful program to keep you entertained during this weekend, including tours of our local area and lots of activities at the showground. The evening is when everyone comes together around the campfire. The array of night time entertainment is sure to prove to be enjoyable and a get great way to have a lot of laughs and meet new friends! Narrabri Shire is truly nature’s playground. We encourage you to stay on in Narrabri Shire at the conclusion of Campfire and enjoy the other things Narrabri Shire has to offer. From the Pilliga State Forest, wide expansive plains producing world quality agricultural product to the beautiful and majestic Mt Kaputar National Park. Take the Great Artesian Drive and enjoy the relaxing hot pools. Download (20Mb) our latest Visitors Guide! 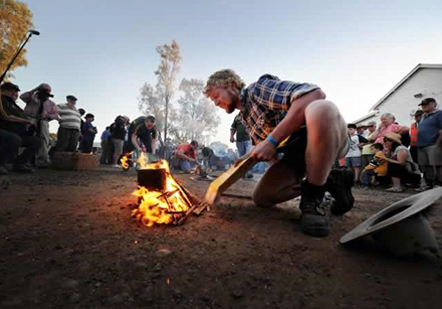 The Boggabri Drovers’ Campfire has become a much anticipated feature for caravanners, motor home own ers and traveller‘s along Australia’ s highways and by ways. The event was the brainchild of Lion Ge off Eat her and was developed with the support of the Bogg abri Lions Club.